This antenna is designed for the WatchMate Vision AIS Transponder. It may also be used as a replacement antenna for an XB-8000 or XB-6000 AIS Transponder. It combines a high performance GPS antenna and a low noise amplifier into a state-of-the-art compact and fully waterproof enclosure. This innovative antenna design has two mounting options; Pole Mount or Base Mount. 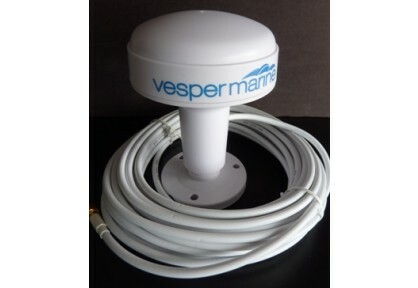 As well as being easy to mount it comes with a 10m (32.8 feet) cable that has a small diameter connector making it easier to route the cable through smaller holes. Compatibility: For use only with a WatchMate Vision or as a replacement antenna for an XB-8000 or XB-6000. Click here for the correct antenna for a WatchMate 850.